SPRING CAMP 2019 IS GOING TO BE THE BEST YET!!! Sign Up Today – We Will Fill Quickly! Registration is OPEN – Click HERE. 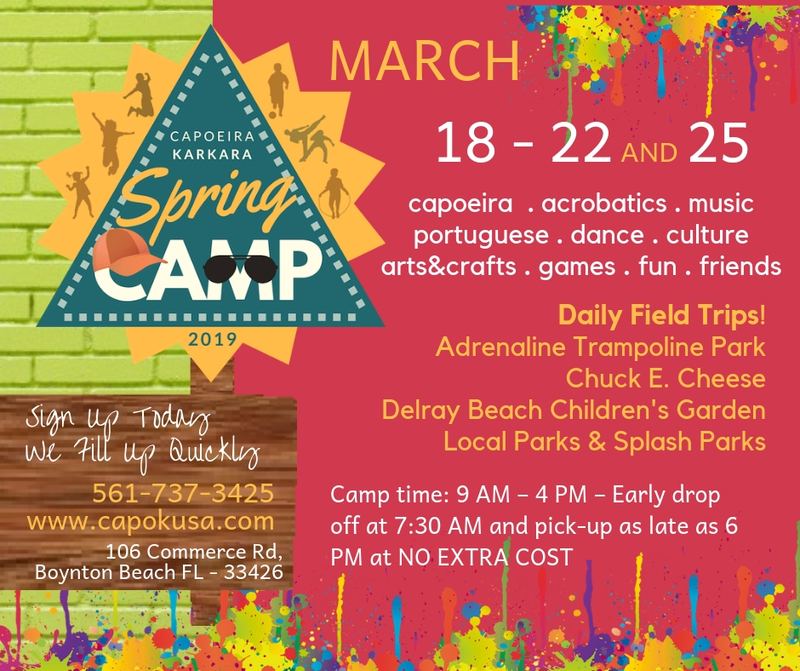 Thank you for choosing CAPOEIRA KARKARÁ’S SPRING BREAK DAY CAMP 2019! Your child will have a blast, getting plenty of exercise and having fun in a positive, nurturing environment. Aside from instruction in capoeira, dance, music, acrobatics, Portuguese Language, yoga and more, we will be doing fun activities, arts and crafts and games and going on field trips to fun places for kids of all ages! Our curriculum is designed to enrich the life of each camper – not only physically, but also mentally and socially. We accept children ages 5 – 13. 6 full days of FUN! *This is a sample Schedule to show you normally how our daily routine goes. This is subject to change at the discretion of the camp directors and/or according to our field trip schedule. Please inquire if you have specific questions regarding our daily schedule. If you need to drop your child off or pick up between 9 am & 4 pm please notify us in advance. The camp is directed by Mestre Betinho and Professora Sara Conceicao. They have been teaching capoeira to children locally since 2006 and share their passion for capoeira, fun and fitness with their students in the academy on a daily basis. They have a combined experience of almost 50 years in capoeira and Sara holds a Master’s Degree in Education and is a certified Kids Yoga Instructor. Other qualified counselors and professionals training under Mestre Betinho will assist in teaching during Spring camp.